The weather in South Dakota this year was ideal for the pheasant hatch. Photo by Sam Stukel. The hunting season that brings $200 million to South Dakota is kicking off soon. Pheasant hunters will be flocking to what some call "the pheasant hunting capital of the world" this October for what is expected to be a great season. Travis Runia, a senior upland game biologist with the South Dakota Game, Fish, and Parks Department (GFP) says he doesn't like to predict a season, but has high expectations for hunting numbers this year. In 2017, more than 67 thousand people came to South Dakota for the Pheasant season. The bird count for last season was down 45 percent from 2016 and the number of birds harvested was poor as well. "It was the lowest we had in a really long time," said Runia. Part of the reason for a poor hunting season could have been the weather. The summer of 2017 saw widespread drought, leaving little cover and less insect population for pheasant chicks. Runia says the drought last year was nearly devastating to the pheasant population. This spring, the tables have turned; 12 counties in southeast South Dakota have received almost too much rain. Too much rain in the peak hatch season (June) can tremendously reduce chick survival. The above-normal moisture is great for vegetation, but it isn't great for pheasant chicks. Runia says the biggest impact on the 2018 brood count index will be the weather. Long-term population trends are affected by habitat availability, and habitats are affected by weather conditions. Biologists at GFP hope for normal precipitation for most of the state to see thriving pheasant habitats. In the central part of the state, where it is a little more dry and thick with pheasants, biologists like to see precipitation a little better than normal. Lush vegetation throughout the growing season means bountiful habitat for pheasants. Runia says in the past 25 years, numbers have been good, but short-term, weather is what drives big changes. While the perfect weather conditions would give pheasants an ideal place to hatch and grow, they also present hunters with better opportunities when the season comes along. Without good cover on the ground, it is hard to get near pheasants or run dogs on the hunt. Runia expects the 2018 hunting season to be better because of the lush green grass we are continuing to see at this point of the summer season. When it comes to hunting season, the weather can really affect hunters and their dogs. Runia early in the season, when the weather tends to be a little warmer, it is important to watch dogs carefully. Runia advises taking plenty of water and plenty of breaks. Ideal conditions for a good hunt are cool enough to run dogs to their full potential, with just a bit of moisture in the air. Runia says the added moisture makes it easier for dogs to keep a scent track. In the western part of South Dakota, hunters may be after prairie grouse and ruffed grouse rather than the infamous pheasant. Runia says those birds thrive under the same conditions as pheasants, finding habitat in lush green grasses. While there is no index survey for these birds, he expects those to be plentiful as well this season. Hunters will have a better idea of what to expect after the Pheasant Brood Survey is finished this summer. The 2018 Pheasant Brood Count Survey will conclude on August 15. Biologists drive 30-mile routes counting every bird they see every ⅛ mile. They drive 110 routes throughout the state every year. "Our survey is done the same way every year," said Runia, "The same route, with the same conditions, driven the same way." The index will give a state-wide bird count, but will also be broken down into local and regional counts to give hunters a better idea of where pheasants are located. 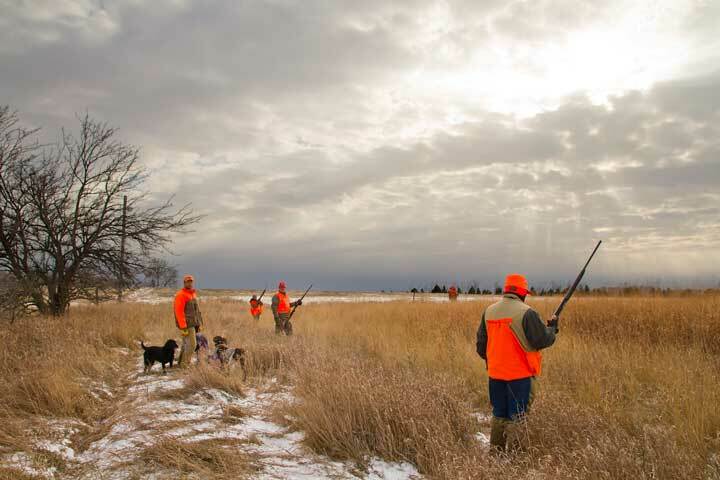 South Dakota offers an abundance of public lands, open to hunters and thick with pheasants. The 100th South Dakota Pheasant Season kicks off on October 20. Youth hunters have the opportunity to hunt October 6-10, and residents October 13-15. Out of state residents who are looking to pheasant hunt in South Dakota should be sure to contact the SD Game, Fish, and Parks Department for information. You can also download an interactive map and app for a guide while in the field. Be sure to register and hunt safe this 2018 season. "This pheasant season is just something to be really proud of," said Runia.